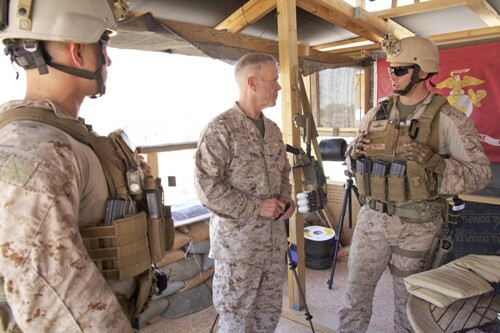 Commandant Gen. Jim Amos, visits the U.S. embassy compound in Tripoli, Libya, on June 16, 2013. He is speaking with a member of 4th Force Reconnaissance Company., a photo by Pan-African News Wire File Photos on Flickr. WASHINGTON — Four American military personnel assigned to the United States Embassy in Tripoli, Libya, were detained Friday and then released after being held for hours by the country’s Interior Ministry, American officials said. The four were believed to have been reviewing potential evacuation routes for diplomats when they were detained, according to the initial reports received by officials in Washington. The State Department spokeswoman, Jen Psaki, said they were working on “security preparedness efforts” when they were taken into custody. The area where they were said to have been detained is not far from the main road to the Tunisian border from Tripoli, the capital. After running into a problem at a checkpoint — many of which are run by local militias — they were detained and later moved to the Ministry of the Interior, said administration officials who asked not to be identified because they were discussing internal reports. Photographs of two American passports and embassy identity cards were later disseminated on Twitter. It was not known if the passports belonged to any of the four military personnel. The buzzing sound of drones filled Tripoli’s sky for hours as rumors spread through the capital that four Americans were missing. Drones are not usually heard in Tripoli, although the sound is familiar in Benghazi. The episode took place in a town just southwest of the historic Roman ruins at Sabratha and about an hour’s drive from Tripoli, Ms. Psaki said. The area is not known for anti-Western extremists or other obvious threats. In part because it is a tourist area, the district around Sabratha skews relatively liberal and friendly to Westerners. Since the attack on the United States Mission in Benghazi that killed Ambassador J. Christopher Stevens on Sept. 11, 2012, employees of the American Embassy have operated with extraordinary caution. But two years after the toppling of Col. Muammar el-Qaddafi, security remains tenuous even in and around Tripoli. Libya’s transitional government has not yet managed to assemble a credible national army or police force. Many families or clans around the country keep heavy weapons, as do autonomous local militias formed during and after the Libyan uprising. Rigorous security rules preclude any movements outside the heavily fortified embassy compound without advance planning and an armed guard. The compound is locked at night, and no one is permitted to enter or exit. Counterterrorism has become a central focus of the work there, and the compound brims with well-armed security officers. The area where the Americans were said to have been detained is controlled mainly by local tribes, not the central government, which is relatively weak even in its own capital. And in the Libyan context, it is easy to imagine that a foreigner with a diplomatic passport and a gun who was stopped at a checkpoint would be presumed to be a spy and therefore detained. The brief detention of the Americans is an experience they share with Prime Minister Ali Zeidan. He was kidnapped from his room in a luxury hotel a few weeks ago, but then released hours later. In the absence of a strong central government, Libyans have demonstrated both a propensity to use the threat of force to try to settle disputes but also a knack for working through networks of neighbors and clans to try to avoid such standoffs. Michael R. Gordon reported from Washington, and David D. Kirkpatrick from Buffalo. Suliman Ali Zway contributed reporting from Tripoli, Libya, and Thom Shanker from Washington.